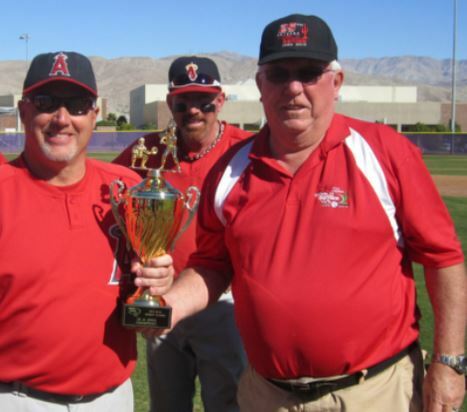 INDIO – The Inland Angel scored three runs in the top of the 10th inning, and then held on to defeat the Santa Ynez Sox 11-8 to claim the 50-and-over division crown at the MSBL Desert Classic held in Palm Springs, California. For the Angels it was very nearly the one that got away. They went into the bottom of the ninth with a comfortable, five-run lead, but the Sox erased the deficit and left the winning run in scoring position to push the game into overtime. What ended up as a high scoring game didn’t start that way. In fact, the game was scoreless until the top of the fifth inning when the Angels’ Kevin Fidler doubled to score Mike Kyander with the game’s first run. The Sox answered with three runs in the bottom of the fifth including two runs on Dan Murray’s single. An RBI single by the Angels’ Dave Kubicek in the sixth cut the deficit, and a sacrifice fly from Fidler in the seventh tied the game at 3-3. The Angels took a 5-3 lead in the eighth inning on RBI singles by Gary Phipps and Beau Wesson, then padded that lead in the ninth on an RBI single by Dave Statter and a two-run double by Marc Emery – who caught every inning of all five tournament games for the Angels. Down by five heading into the bottom of the ninth, the Sox knew they had their work cut out for them, and manager Buck Sharp felt his team was up to the challenge. “We were thinking that we had to scratch and claw and make a comeback and fortunately we had the right guys up at the right time, and we did all the right things,” he said. RBI singles by Steve Tolley, Al Hire and Jimmy DeWitt highlighted the inning and left the score tied going into extra innings. Phipps’, Wesson and Rob Munson had RBI singles in the10th to put the Angels up for good. Munson – who threw all 10 innings — then retired the Sox in order to give the Angels the championship.